Being a great lover of bears, growing up on the stories of King Arthur and fiercely proud of my Celtic heritage it was natural that I would gravitate towards the etymology of Arthur being derived from the Celtic bear gods Artos or Artio. Arthur as a historical figure is of course shrouded in legend, bias and conjecture. I am totally guilty of this and totally support the belief that he held power in Wales, Cornwall and the West Country the lands of my forefathers. The fifth century Welsh word art means ‘bear’. One theory is that art and ur, meaning ‘man’, gives us the name Artur – literally, bear-man. This is supported by late Latin writings which give the name Arturus. There are other variants have been put forward, including Arturius, Arcturus, Arturos and Artursus combining the Welsh for bear – art – along with its Latin counterpart – ursus. I used to play Arthur as my mounted Welsh warlord in Saga, although I almost exclusivaly play as the Irish these days. I am putting together a more extensive and legendary Arthurian War-band for play in Dragon Rampant. Complete with more bears, magical boars and a dragon. 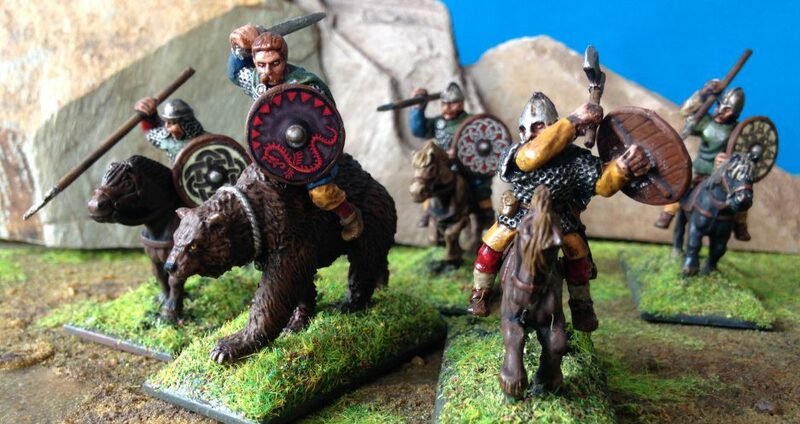 Arthur is a Welsh, mounted, Teulu, (Hearthguard), figure from Gripping Beast, mounted on an old school Citadel Miniatures Wood Elf Bear from the 1980’s. Shield transfer by Little Big Men. Merlin is from the exceptional Footsore Miniatures.